Logitech G603 Gaming Mouse – free yourself of all wires! I’ll be honest with you. Gaming is not the only time I use gaming mice. As somebody who uses CAD programs for work, the added functionality a gaming mouse offers is vital. I have used a variety of gaming mouse in the last few years. Of course, when it comes to mice, Logitech generally lead the way. With the Logitech G603 Gaming Mouse, Logitech have gone one step further. Providing you with all the speed and accuracy of a gaming mouse, with none of the wire! Features the Hero Sensor, delivering up to 12000 DPI of accuracy and up to 10x the power efficiency. Switch between high performance and normal mode with the push of a button, as your sensitivity goes from 8ms to 1ms. Runs off one AA battery or two, allowing you to weigh it as you please. Dual connectivity, connect via Lightspeed dongle or Bluetooth. Onboard memory, allowing you to take your button settings to different computers. The mouse almost looks ambidextrous but is clearly designed for right-handers. A couple of buttons and a wheel sit in the traditional spots. Unlike some of the fancier mice, the wheel only scrolls up and down, and not sideways. Below the wheel is a status LED, plus a DPI cycle button. On the left side, where you thumb will normally sit, are a couple of extra buttons. A couple of extra buttons at the bottom allow you to switch performance and connectivity. All the buttons sat naturally with my hand, and I was able to operate them as needed. At only 91g without batteries, the mouse is not just wireless, but fairly light as well. This makes it the ideal device to use for fast paced gaming. Some people have found the look of the mouse a bit dull compared to your usual flashing LED – bright coloured mouse. Personally, I feel it looks sophisticated and business like! Before I went and used the Lightspeed dongle, I wanted to try the mouse using Bluetooth. I am one of those silly people who has nothing but 4 USB-C ports on his MBP and needed to know how lazy I could be with this device. The setup process is reasonably simple. Using the toggle button at the bottom, simply switch to Bluetooth. This is indicated by the LED flashing blue instead of white. In this mode, simply add or connect to the mouse using your computer. Worked a treat both on the MacBook as well as my work ThinkPad running Windows 10. The one thing I will mention is that Bluetooth mode is more designed for your CAD user rather than a gamer. It is slower than Lightspeed dongle. More so, it also didn’t allow me to connect to the Logitech Gaming Software, which allows you to configure the device buttons as needed. Of course, a push of a button, and then you are connected via the Lightspeed dongle. It takes up a USB port on your device. In return, it gives you a high performing gaming device, sans wires! In this mode, you can change your performance from high to low, as well as make any changes via the LGS software. Using the LGS software, you can easily customise the device. The device comes with 6 programmable buttons. However, 3 of them are the left click, right click and the mouse wheel button. There is a good chance you are not going to mess with those for normal usage. The 4th button is the DPI setting button, which may be a bit too precious during gameplay too. This only leaves you with 2 side buttons. This may not be enough for many, but it was fine for me. Using the software, you can assign any key to it. It may seem like only a limited set of keys is available, but a little playing around allowed me to customise the options available. Once the settings have been changed and saved, you can take your mouse from device to device, and it will hold onto them. So, the wireless Logitech G603, during a high-speed RPG? Did it work? Did it work on Low-performance mode? No, not really. In fact, it is a bit silly to leave it in this mode while you are playing games. On High-performance mode, it worked a treat, and you wouldn’t know any different. Of course, to save battery life, it is advisable to change back to low after you are done gaming. The fact that you can change from one battery to two is a great touch and lets you fine-tune the mouse to just how you want it to be. Half the batteries in does mean half the battery life. 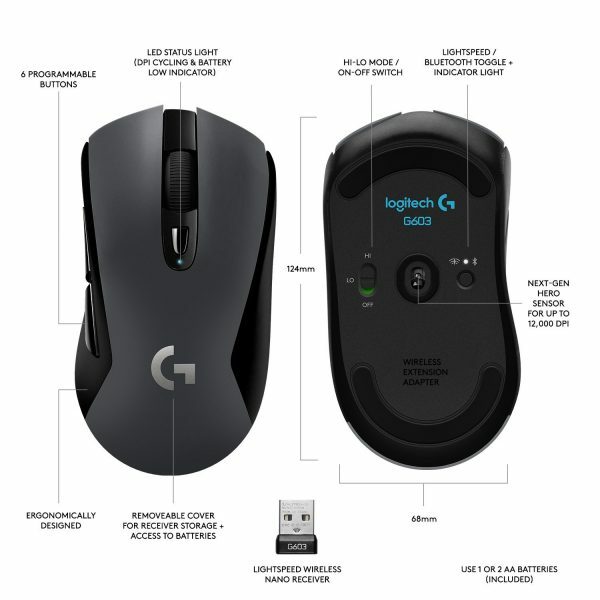 More information on the Logitech G603 Gaming mouse can be found on the Logitech website. Links to download the LGS (Logitech Gaming Software) are available there too. It retails for around £69.99 and is available from various online retailers such as Amazon. Want the speed and no wires? The Logitech G603 is the device for you!